Women who are planning to conceive or are pregnant will most likely be prescribed with vitamin supplements that will prepare their body for the pregnancy and to help in the developing fetus. Folic acid is one of them. spina bifida; it is when the covering around the spinal cord doesn’t properly close therefore leading to permanent nerve damage. anencephaly; a condition where the brain is underdeveloped. encephalocele; a kind of birth defect where the brain protrudes to the skin because the neural tubes failed to close completely. How soon should you take folic acid? Most birth defects happen in the first 28 days of pregnancy. That’s why it is recommended that women of childbearing age, not just those who wants to get pregnant, to get enough folic acid in their diet. It is in that early stage that the brain and spinal cord is developing and the presence of folic acid in a woman’s system is crucial. Studies show that women who have been taking 400 micrograms of folic acid daily before conceiving and during the early days of pregnancy reduce the risk of babies being born with neural tube defects by 70%. The recommended dose is 400 micrograms if a woman is of childbearing age until the first three months of pregnancy. From the fourth month until the woman gives birth, it should be increased to 600 micrograms. 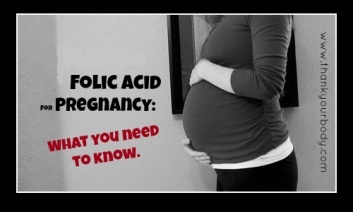 However, there are certain situations when your doctor may give you a larger dose of folic acid. For example, if you are severely overweight your chances of having a baby with a neural tube defect (NTD) is high thus the need for a higher dosage. Although it’s still not clear why this happens, a visit to the doctor is necessary. If you previously had a baby born with NTD, then you have to inform your doctor (if you changed OB) ahead and see him or her before getting pregnant. The chances of having another baby born with NTD is high; however, the risk can be significantly lowered down by getting a higher dose of folic acid. Ask your physician for the exact dosage. >>> Breakfast cereals and bread can be a good source of folate. You can check the nutritional panel found on the packaging to find out how much folate it contains per serving. >>> Green leafy vegetables such as broccoli, asparagus and spinach are dense with nutrients and folic acid. The darker the leaves are, the more concentrated it is with folate. >>> Beans like black beans and kidney beans are another source. An average cup can already give you 180 micrograms of folic acid. >>> If you are not a big fan of liver, you may have to reconsider. A hundred grams of braised beef liver can give you up to 70% of your much needed folic acid.